Every child loves peluches because they keep them company, they give them a certainty with that tender face and they are excellent protagonists for incredible stories invented by them. Many of them, prefer to have a favorite puppet that remembers their little dog to carry around in all those places where the real dog can not enter. So on the occasion of birthdays, Christmas or even Easter thanks to the Chi Chi Love, if you do not feel like taking a real dog because of the great responsibilities that it entails or the time to devote to it, since it is not a toy, an excellent idea could be to give a Chi Chi Love with all the features of the Chihuhua, to which you can combine clothes, colored collars or various objects that allow you to pretend to be real dog-sitters or a renowned groomer! 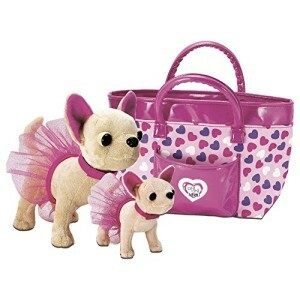 The world of dogs Chi Chi love is really huge and it is a pity to settle for just one instead of not completing the whole collection, consisting of puppies of one more beloved than the other and with a different style. 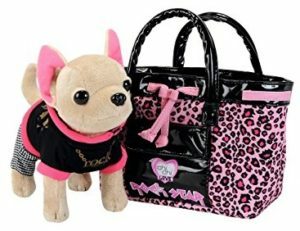 For the most romantic girls there is the tender Chi Chi Fancy Feathers with the pink Chihuahua dress and the matching bag, as befits a princess or the queen of all these beautiful stars, the Chi Chi Love Beauty Princess, whose her crown and the handbag with fur make all the lovers of these little pets go crazy. Loving dogs is a beautiful thing and Chihuahuas are particularly exposed to these feelings because it is very difficult to resist to them, because of their size and their sweet face, but being dogs in all their effects they need their space and the maximum respect for their needs. Not everyone can therefore afford to care for a real Chihuahua, but children do not always understand this; for this reason, in order to cater to parents who want to please their children but do not feel able to support this responsibility, Chi Chi Love has created this line of toys that satisfies all tastes and it finally allows to fill the house with Chihuahuas, so you can pretend to have a four-legged friend and in the meantime to practice taking care of the future real dog. 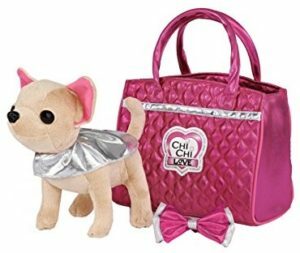 The prices of a Simba Chi Chi love soft toy can range from 20 to 70-80 Eur/Gbp, depending on the model and accessories included in the kit. Previous articlePrevention and Treatment of parasites Chihuahua, Guide and Advices. Next articleThe dangers for a Chihuahua, Guide and Advices.